The Village at Boulder Ridge is happy to host your next family reunion, class reunion, anniversary or birthday party, or other special event! We offer 4 options: Barbeque Menu - Starting at $25 per person Brunch Menu - Starting at $27 per person Italian Dinner Buffet - Starting at $32 per person Traditional Dinner Buffet - Starting at $40 per person Please see the attached Special Event Menus for more details. The Village at Boulder Ridge is available from May - September for corporate and private outings. All events run from 12pm – 6 pm unless otherwise agreed upon in the event contract. Minimum attendance is 125 people on a Saturday and 50 people on Sundays and weekdays. Please see the attached Corporate Outing Menus for complete information on our Corporate Outing Packages & Pricing. School Outing Menu - $39 per Student Please see the attached document for complete information on our School Outing Menu. The Village at Boulder Ridge is open each year from May to October. Our rustic banquet hall is situated on 70 beautiful acres. We offer both indoor and outdoor ceremonies and receptions. With only one wedding per day, we provide every bride & groom our undivided attention. Please see the attached document for complete information on our Wedding Pricing & Packages. Please see the attached Wedding Packages & Information for more detailed menu & package information. The Village at Boulder Ridge is open each year from May to October. Our rustic banquet hall is situated on 70 beautiful acres. We offer both indoor and outdoor ceremonies and receptions. With only one wedding per day, we provide every bride & groom our undivided attention. Please see the attached document for complete information on our Wedding Pricing & Packages. With indoor seating capacity for 75 to 300 guests, the Main Banquet Hall is the perfect location for small and large weddings. 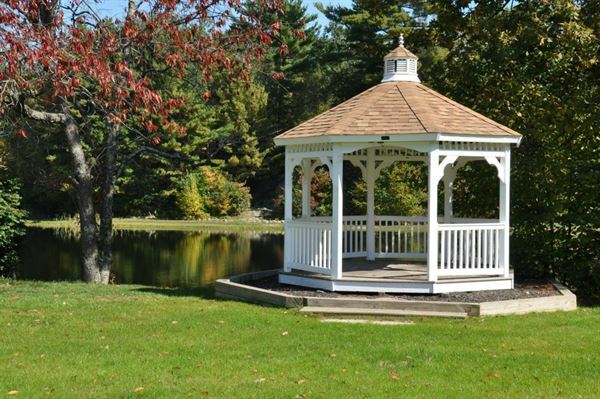 Our outdoor pavilion can seat up to 200 guests, should you want a more casual, open-air reception, overlooking the pond and pool.